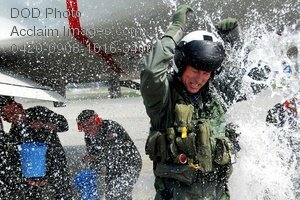 Description: Free, public domain image: Navy Commander Being Splashed with Water from Members of His Squadron. WHIDBEY ISLAND, Wash. (April 29, 2009) Cmdr. Christopher Saindon is splashed by water thrown by members of his squadron, Patrol Squadron 40, as he departs the flight line for the final time before turning over command of VP-40 in a change-of-command ceremony May 1st. VP-40 is scheduled to deploy to Iraq in May. (U.S. Navy photo by Mass Communication Specialist Seaman Michael James.